The “Round Graff Fancy Vivid Yellow Diamond watch” is set with 211 diamonds weighing 59.25 carats. The “Graff Fancy Vivid Yellow Diamond Watch” is set with 60 diamonds weighing 25.85 carats. Both watches house Swiss-made quartz movements, so the allure is clearly focused on the jewelry aspect of the timepieces. The third yellow diamond watch will only be revealed at BaselWorld. The watches are a joint effort between the Swiss-based Graff Luxury Watches and Graff London’s high-jewelry atelier. Since its founding in 1960 by Laurence Graff OBE in London, Graff has been creating diamond works of wearable art that are nearly unrivaled in quality and stone rarity. 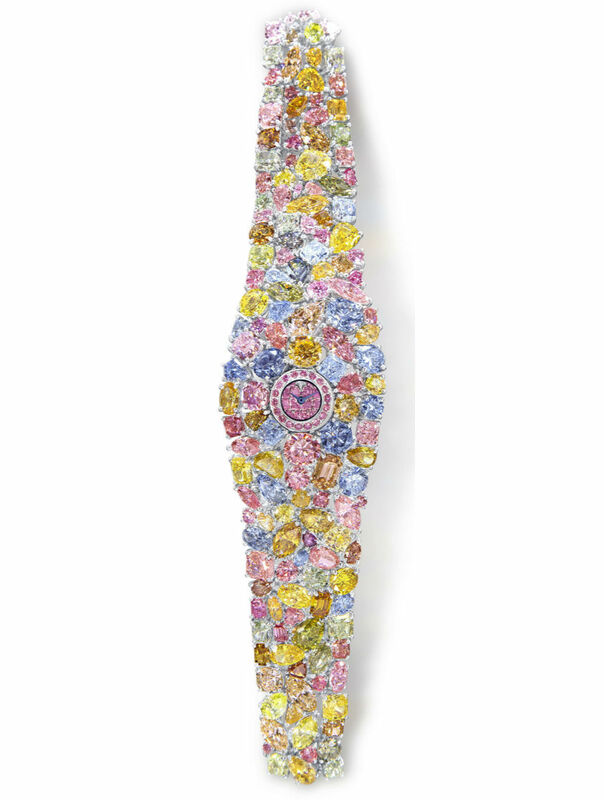 The prices of the timepieces have not been disclosed, but if one is in the market for such a piece, consider yourself forewarned: in 2014, the jeweller created the Graff Diamonds Hallucination, a women’s watch covered in a kaleidoscope of diamonds and priced $55 million, which might be the most valuable watch ever created. It included 110 carats of extremely rare and large colored diamonds set into a bracelet of platinum. The watch featured diamond colors: Fancy Vivid Yellow, Fancy Intense Pink, Fancy Intense Blue, Fancy Light Pink, Fancy Light Grey Blue, Fancy Intense Blue, Fancy Green and Fancy Orange.